The practice of yoga may be thousands of years old, but recently modern research and study has brought its many benefits into the spotlight. In addition to increasing flexibility and strength, using yoga for lower back pain seems to be getting the most attention, sometimes with startling results. Researchers have been finding that yoga is a powerful treatment for even some of the most serious back pain conditions, such as scoliosis. In this article, we’ll also look at some OM-azing yoga poses that can work for general back pain and discuss some of the merits (and cautions) about hot yoga for lower back pain. Why should you try yoga for lower back pain? Yoga stretches and strengthens every muscle in the body. Even basic poses offer a wonderful foundation to build muscle strength and flexibility, develop a strong core, and reduce back pain. As the following video explains, a large majority of lower back pain cases are due to inflexible or weak muscles in the back. When your lower back pain is related to the muscular issues, using yoga for lower back pain may be a very effective treatment method. The poses outlined below can be used independently or together as a practice. Even carving just 15 minutes from your day to move and breathe could help you reduce your lower back pain. 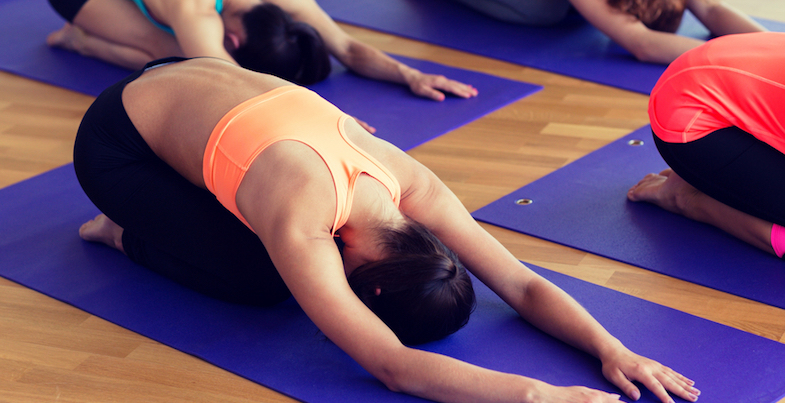 Several studies, including a 2013 meta-analysis of research published in Pain Research and Management, have found benefits of using yoga for lower back pain. Before trying any new exercise regimen, however, always talk to your pain doctor. They may be able to recommend poses that will work better for you or advise you on ones to avoid. And, as every good yoga teacher should tell you, take it carefully and take it slow. Yoga is meant to be a restorative, relaxing, and energizing practice. If you ever feel sharp or severe, back off and try a gentler approach to the pose. If allowed by your pain doctor, try these six poses to see if yoga works for your back pain. These can be helpful for people who suffer from general and muscular types of back pain. Resting on all fours, with the knees below the hips and hands below the shoulders, breathe in as you lift your tailbone up. Let your belly sink to the floor while your head and chest rise. Then, exhale as you reverse, arching your back like a stretching cat. Continue this exercise slowly for ten or 20 repetitions, breathing deeply and moving at your own pace. From your hands and knees, tuck your toes and lift your tailbone into the air, forming an upside down “V” with your body. Reach your heels down to the floor, but don’t worry if they don’t touch. Feel the stretch on your hamstrings and the lengthening of your back. Keep the feet hip-width apart and your hands pressing into the floor. Stay here for about one minute. From downward dog, shift forward onto your hands into a plank position and lower to the floor. Keeping your arms by your side, lift your head, chest, and legs away from the floor. You might only be able to lift a few inches off the ground; that’s okay. If lifting your shoulders and feet at once is too much, try alternating by raising the chest only and then lowering before lifting the legs. Stay elevated for 30 seconds and then release. Relax for a moment, and then repeat once or twice more. This pose strengthens the back muscles and provides a slight back bend without overly exerting the spine. Roll over and lie on your back. Bend your legs and press your feet into the floor, keeping your upper body still. Press into your feet and lift your tailbone, curving your back as much as feels comfortable. Clasp your hands under your back, pressing them into the ground. If you have a yoga block available, try placing it at the base of your spine for support. Stay here, breathing, for about one minute. On your back, lift one leg straight into the air. Wrap a towel, a belt, or a yoga strap around your foot. Holding onto the excess material, lift your leg toward you in a 90-degree angle until you feel the hamstring stretch. Stretch for one to three minutes, and then repeat on the other side. This pose deeply stretches the muscles in your lower back. When you’re just starting out, take this pose slowly and don’t over twist to aggravate any lower back pain. Begin by sitting with your legs stretched in front of you. Move your right leg so your foot is pressed up to your left buttock. Bend your left leg so your knee is pointed up and place your foot on the outside of your right knee, which will gently twist your lower back. Raise your arms and place your right elbow against your left knee and your left hand on the floor behind you. Keep your head and upper torso facing forward. Hold for several breaths, release back to center, and repeat with the other side. Start by kneeling and then stretch your arms forward until you’re lying facedown, with your bottom raised. You can take child’s pose as deeply as you need to. By spreading your legs, it will create less of a stretch on your back. Likewise, you can raise your bottom slightly to also take off some pressure from your back. Child’s pose gently stretches and helps reduce tension in the back and neck. Does hot yoga for lower back pain work? Yoga has long had a reputation for slow-moving postures that are relaxing and induce a nirvana-like state, but hot yoga is here to shake that image up. One of the most popular and traditional forms of hot yoga is Bikram yoga, a series of 26 poses performed in a heated room (usually up to 105 degrees with a humidity of 40%). The goal of hot yoga is to increase flexibility in the joints and to tire the muscles out, but there are increasing testimonials as to hot yoga’s effectiveness in treating serious back pain and injury. So, while there’s no definitive proof that yoga for lower back pain works, there are many who have found relief by trying it out. As always, consult with your doctor before starting a new exercise program. Start slowly and listen to your body if you’re going to try hot yoga for lower back pain! Holding side plank an average of one and a half minutes a day for six days a week, after six months, there was a significant decrease in the measure of the scoliotic curve. Nineteen of the 25 patients saw a reduction in the curve of just under 41%. Dr. Loren Fishman, lead researcher of the study believes that it is the uneven nature of the exercise that helps change the uneven curvature of the spine. Teachers and students alike say that yoga was their choice for treatment of scoliosis. John Friend, founder of the Anusara school of yoga with its focus on heart-opening and proper alignment, says that his scoliosis was completely corrected by his intensive yoga study. For Maura Roth-Gormley, yoga teacher at Baltimore Yoga Village in Maryland, a combination of the alignment principles of yoga studied and practiced deeply during her teacher training with Shiva Rea and intensive study of ballet were key in healing her back. Even if the practice of yoga is ancient, research on its benefits of yoga for lower back pain is still in its infancy. Because of this, it is imperative that you begin your practice under the supervision of your doctor and with a qualified yoga teacher. Yoga teachers are not regulated in the U.S., but teachers registered with the Yoga Alliance as either RYT-200 (a registered yoga teacher with 200 hours of training) or RYT-500 (registered but with 500 hours of training) have met a standard set of rigorous training guidelines. An “E” indicates that they are experienced teachers, and most Yoga Alliance-certified teachers also list any specialties they may hold (e.g., prenatal yoga or therapeutic yoga). Start slowly, and listen to your body. Some soreness after activity is to be expected with any new exercise program, but sharp, stabbing pain or shooting pain is an indication that something is not right. Approaching yoga for lower back pain in a gentle, restorative way can help you learn to find relief from pain while improving your flexibility and stress levels. And, while many people may find relief by trying yoga for lower back pain, other more severe causes of back pain may not respond well to this treatment. Some patients may even find that their back pain intensifies after trying yoga for lower back pain. Because of this, it’s imperative that you talk to a pain doctor first to determine the source of your pain. In this way, you can avoid any activities that could increase your pain. Likewise, they may be able to suggest more appropriate therapies for you. 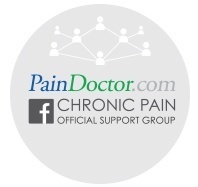 Click the button below to get in touch with a PainDoctor.com certified pain doctor to discuss your lower back pain condition!